Or, The-Late-Bird-Gets-the-Bargain Cobbler. Or, It's-a-Party-in-the-Biscuit-Tent-and-Drupes-Are-Invited. As I was taking the de-escalator to the train today, a stranger just leaving the farmer's market asked me for the time, and then launched into a peach paean. He was a photographer, he explained. "You can slice them, and watch the droplets of juice bead on the cut." I was already feeling a bit sorry for myself, being in such a remarkable hurry to walk somebody's dog that I couldn't stop to browse the overflowing market stalls for myself. I should've, though. The train tunnel was clogged for the better part of an hour, a polished intercom lady-voice repeating over and over that the N was arriving in 2 minutes. The poor dog was crossing its legs and doing the dance by the time I arrived. On the way back, I was terribly afraid the market would be packed away entirely. All those peaches and their beads of juice. Maybe there were pie cherries, too? Fruit on the brain, I skidded to a halt right at the toes of a 7-foot cop asking for the ticket I hadn't purchased. I didn't hide my infinitely-flusterable calico-two-shoes propitiating nature, and after a gentle reprimand, the guard let me on my way, with assurances that I really needn't worry this time. I ran up the escalator with my adrenaline rush to find that the market was closing up. Vendors hawked their last-minute bargains, and I swooped in to snag large dollar-bags of peaches, apricots, and cherries. After eating half a dozen of my juicy drupes over the kitchen sink, I cast about for a good fruit-dump recipe for all the ripe stuff I couldn't reasonably consume in one sitting. I struck on Fannie Merritt Farmer's peach cobbler recipe in the Boston Cooking School Cook Book, notable for its use of an egg for thickening. Preheat oven to 450 degrees. Combine egg, sugar, and peaches. Pour into buttered 9" baking dish. Dot with butter. Cover with biscuits (I like making rhombi and arranging them radially). FMF and her BCSCB don't give a timing, but bake till the biscuits are golden and the peaches are bubbly. She recommends serving it with Butterscotch Sauce, Hard Sauce, cream, Hot Orange Sauce, Lemon Sauce, Soft Custard, or whipped cream flavored with cinnamon and sugar. I shall have to have mine plain like the holes-in-my-stockings ticketless pauper I am. Update: Reduce the sugar to 1/2 cup or less if you have cusp-o'-ripeness ambrosial fruit (which is, of course, the ONLY kind you should have). 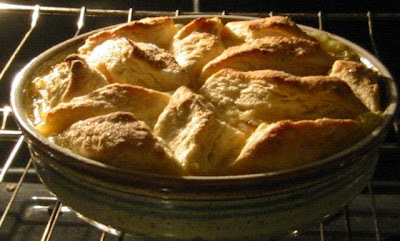 I baked my cobbler a little past golden, as the biscuits just weren't getting done. I do like a nice boggy-bottomed biscuit on my cobbler, but it ought to be soggily saturated with fruit juices, not underdoneness. Especially because I used some rather sketchy whey and sour milk for the biscuits, which is only acceptable if they bake through entirely. I made quite a similar fruit dump cobbler just the other day. Literally using a little it of everything available in the market, or in the fridge already. So tired old cherries, but fresh peaches, nectarines, raspberries, blueberries. An ordinary crumbly topping rather than biscuit like yours. But here's the kick: a splash of campari with the fruit. Added just the right bitter edge.